Dip rice paper in water and rotate to slowly wet each side. Don’t wet too much or it will collapse. Transfer to a flat surface before rolling. You can also use PUREFOODS LONGANISA HAMONADO as an alternative. 1. Fill a large bowl with warm water. 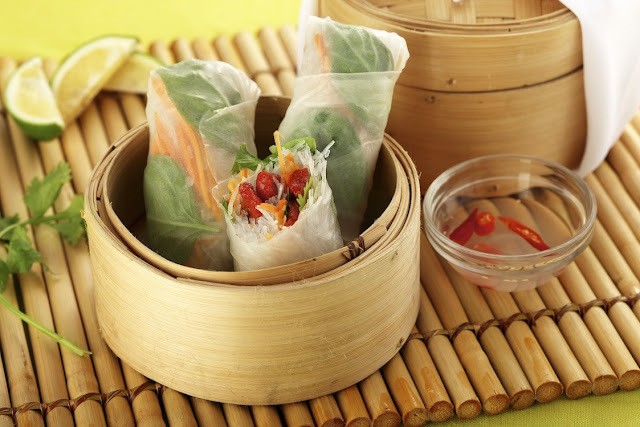 Dip two rice papers carefully until it softens. Lay rice paper on a clean cloth. 2. Arrange basil and lettuce leaves at the top center of the rice papers. Then add vermicelli, pork tocino, a sprig of cilantro, bean sprouts, and carrots. Now fold the bottom side inward, and then tightly roll the rice paper. 3. For the sauce, in a saucepan, combine all ingredients. Heat until sugar is dissolved. Let cool before serving. Home Foodie is all about inspiring home cooks to reinvent favorites and recreate dishes from food discoveries using San Miguel Pure Foods products.